Several years back Doug and I decided to head into Los Algodones, Mexico for dental work. I have health issues that were effecting the enamel of my teeth, and to get the work done in Canada would have been thousands of dollars. To make a long story short, we have been there many times, and over the years have had the most fantastic work done by Harvard grads for a fraction of the cost at home. During our first few visits we came to know Tim and his cousin Omar who worked at the clinic. Within a short time, we were invited back to their village to celebrate Tim’s daughter’s birthday, and to meet his family and friends. Needless to say, within an extremely short time, we grew to love our new friends, and to date, we view them as our family. Over the years we try to get there as often as possible. Today is the only day both Tim and Alex have off work, so we made plans to meet them in town and they would take us back to see the home they are building in CD Moralis. 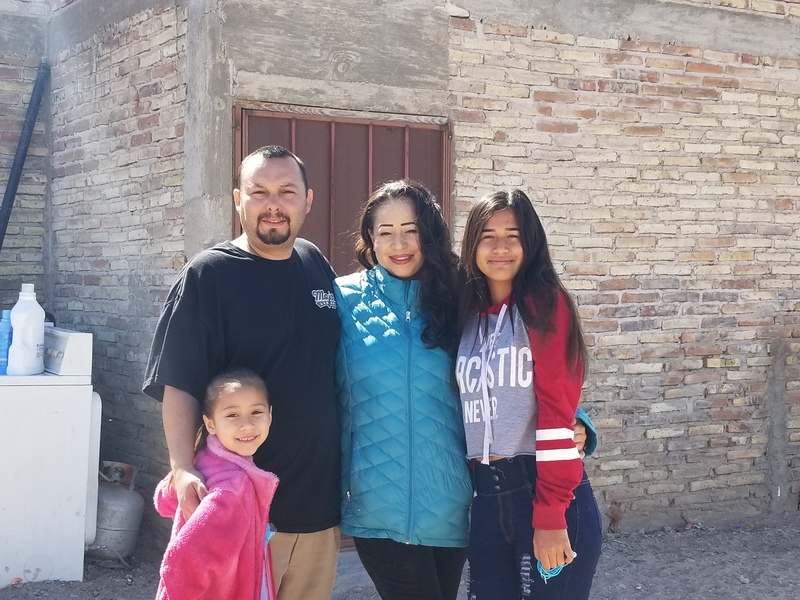 I can’t tell you how wonderful it was to have an entire day with them, and see the home they have been building brick by brick for the past five years. First we went to their home and showed us what they had accomplished so far. They have one large room, that supports the kitchen and family room, and the most beautiful bathroom I have ever seen! To give you a clear overview, Tim, his wife Alex, their two daughters and son live in this one room. The floors are concrete, and the house is made from hand made brick and adobe. Outside, their rather large lot is fenced, and there are pallets of bricks that they buy as they can afford them, that continue to pile up to become a part of future bedrooms. Oh my goodness! When my FISH taco came, that I was told is caught fresh daily and brought from the ocean a few hours away, I did my best to look enthusiastic. I watched as Doug took his first bite of the shrimp he had ordered. He had a look of shock and delight on his face as he savored this new cuisine. (Of course we had heard of fish Tacos before, but when you get away from the tourist areas, you are eating things you may never try at home). Anyhow…. I took a bite of my taco…. of my gosh! HEAVEN!!!!!!!!!! I started laughing so hard 😉 This was one of the best things I had ever had. Over the course of our meal I ordered two more, and Doug had another four I think! In case you are not familiar with Mexico, you buy water. You can not turn on your tap and just drink it. So… pop… or soda as they call it is a staple. I had Fish taco’s , loaded with cheese and root-beer. Better than any steak and lobster dinner I may of had back home. We had not seen Omar yet, but his dad was there. We love him to bits too. We always take pictures of him and Doug because they look like brothers! 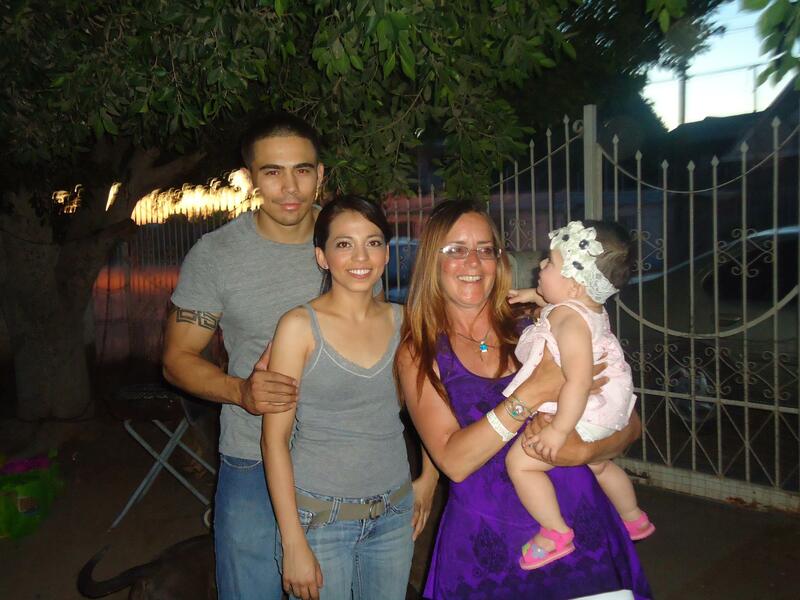 Omar and his beautiful wife Betty, live with their daughter in Mexicali now. We learned that Omar still worked at the original dentist we use to go to, so we will be heading there in the next few days to see him. Once our meal was over, we went back to Tim’s to visit. We had a great day. Their second oldest, whom I know as Handy, was no longer a little girl. She is taller than I am and has a boyfriend. 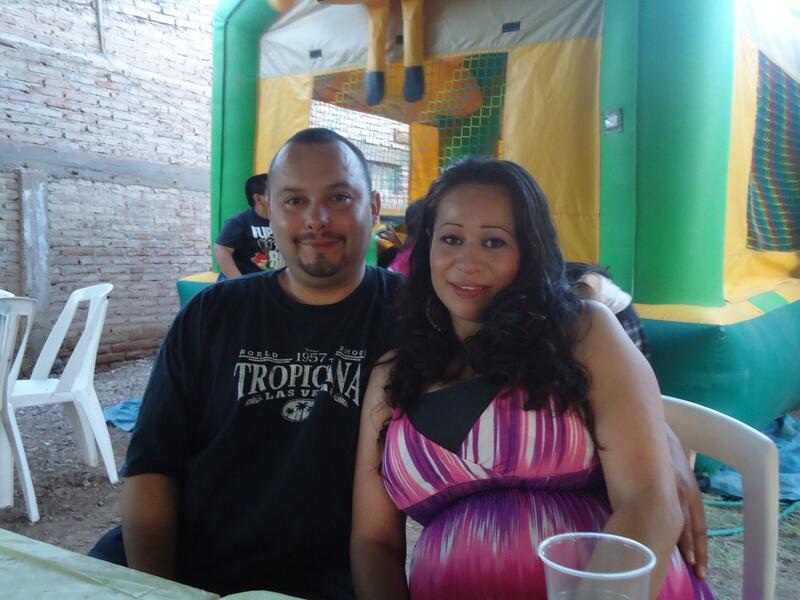 And the baby… well naturally she grew up too, and loves candy! Lol. Handy was on the hunt for an accordion. Over the course of a couple years, she admitted she had taken her lunch money for school and stashed it aside to buy one. Can you imagine wanting something so bad that you go secretly go without lunch at school for that long to buy something you want, without asking your parents for it? R E S P E C T !!!!!! In Canada and the USA most kids are just handed what they want. Our kids do a few chores and they get handed a five or twenty dollar bill. It makes me shake my head how much we take things for granted and how spoiled and entitled most of our kids are. I love Mexico! Even as I write this, my thoughts drift back to the Slabs. The people there may not have much, but they get free food and cloths and furniture donated by the truck loads almost every weekly. Many have monthly checks or food stamps as well. I know Mexico is a different world, but the contrast to what people expect in different countries is an eye opener for sure! It took a 15 year old girl from Mexico, to open my eyes to not only how blessed we are, but how entitled we in North America feel sometimes. Actually.. I ask myself this question. Between Canada, the USA and Mexico, who are truly the richest people? I mean… lets not talk about Drug Lords and crap like that…. just the average person. Who is happier? Food for thought. When Doug and I were in Cuba with the locals, I now see that they were the same. They had nothing. They expected nothing. They were happy. Of course they all want change… but it’s just different somehow. Their lives are slower paced. Peaceful. Uncluttered. After we had a wonderful afternoon together, we checked the time and noted we would have to be leaving soon to get our Dogs out of the Doggy Daycare in Yuma before they closed. Tim insisted we had time to see something before we left that he thought would be very interesting to us. Alex, Tim, Doug and I piled in the car, and guess where he took us? The CEMETERY! I thought that was the strangest place to take tourists, but Timbo wouldn’t take us anywhere unless there was a good reason. Still felt a little creepy to me. Ok.. well, I had no camera gear with me, but I did have my phone. However, why on earth would he want to take us to a cemetery? It was not till he wound through the street of the town to the outer limits on a rough road, that I saw something I could never of imagined in my entire life. I regret not having my camera gear with me, but I think these snaps will give you a great idea of what we saw. Alex and Tim shared some information about their culture that we had never heard of. 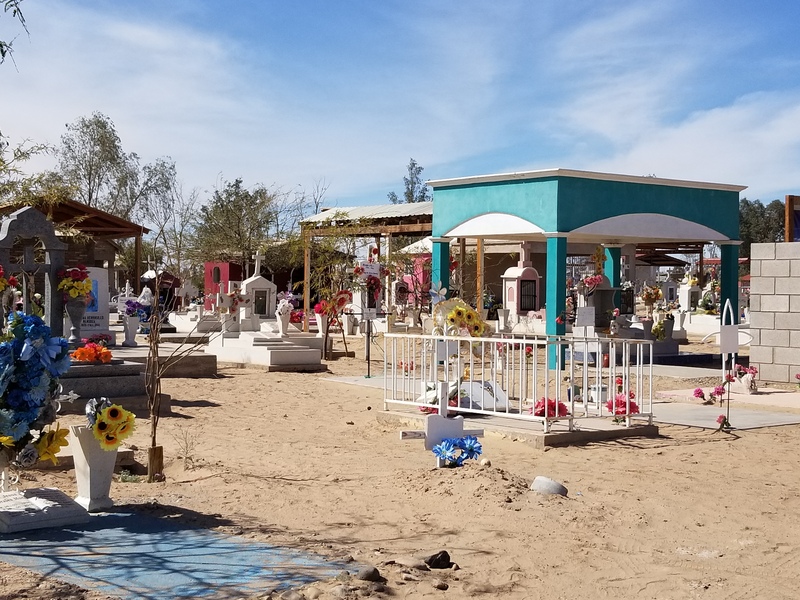 In the Mexican culture, many people spend more money to bury a lost loved one, than they will spend on their own homes. In truth, the Cemeteries are fabulous! There is one huge section dedicated to babies and children. Oh my gosh…. flowers… all I could see was flowers and little brightly painted houses. Some had glass cases above the plot with flowers inside, teddy bears, toys and photos. Others held precious mementos. Did I mention flowers????? EVERYWHERE FLOWERS! Fresh flowers. Beautiful flowers! 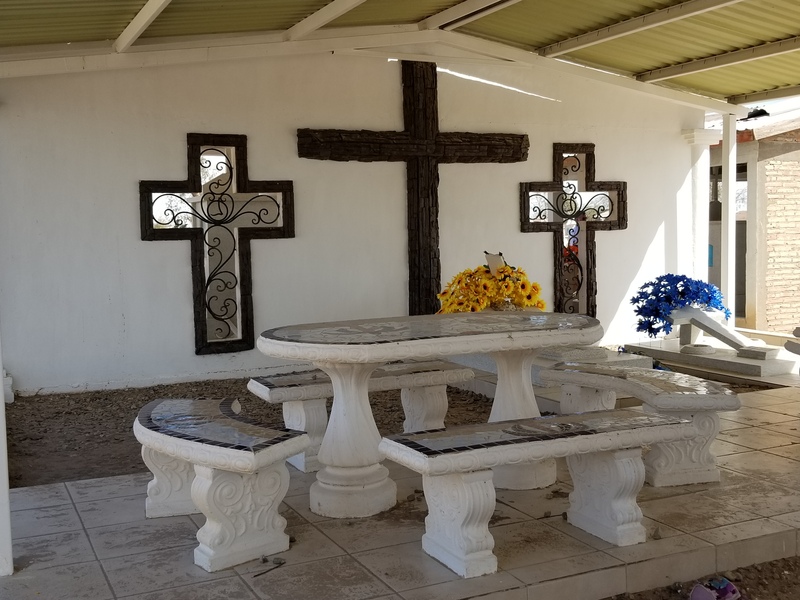 These grave sites were not sad and unattended. They are obviously well taken care of and people had to be going there on a regular bases. I noticed that no matter how old the stones were, the grave sites were groomed and loaded with gifts, and flowers. Fresh paint in pinks, blues, greens, yellows, purples and just about any other beautiful shade decorated the tiny homes or display cases. I will have to ask Tim what they are called. They looked like little houses. Then we crossed the street to where the adults rested. Again there were brightly coloured little homes, flowers everywhere, and some of plots had marbles tables and benches beside the plots. As we wandered through the massive area, we came across some huge buildings! When you walked into the open air buildings, there were elaborate tables, and signs of people who had been there and had had a party. It wasn’t unusual to see tequila bottles scattered on the ground. Tim told us the richer you were in life or the more important you were to your community, the bigger the burial plot and more elaborate. According to Tim, if you were a very wealthy man or a drug lord, for example, you may be buried in a building that is the size of an apartment, and some even had air conditioning for visitors.People come, they party, drink and honor the deceased. Here is the kicker. 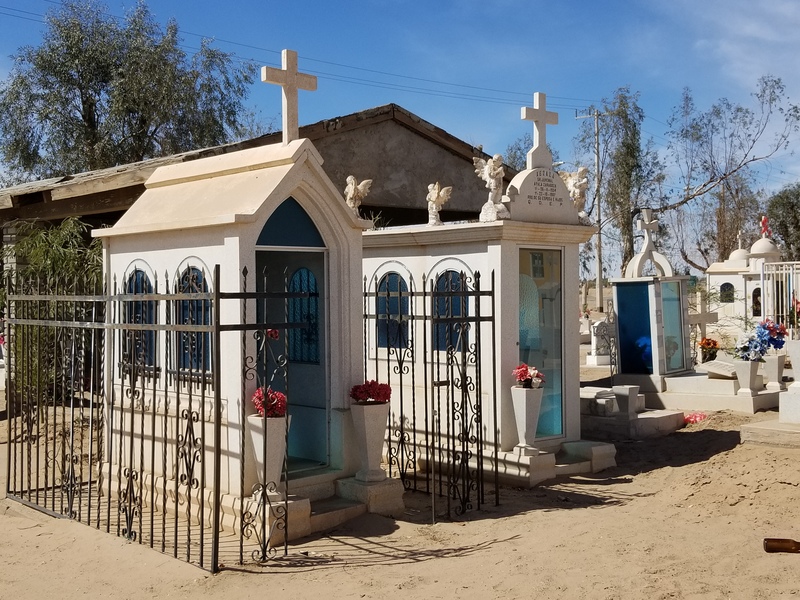 Although not practiced by everyone in Mexico, they believe that you must visit the dead on a regular bases. 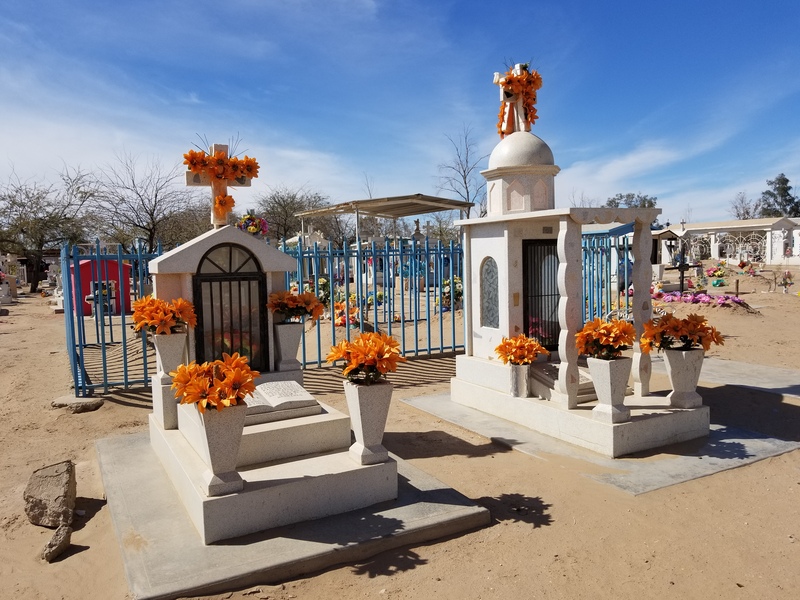 Some go to the graves and party, have celebrations and of course refresh flowers and bring expensive gifts. The reasoning is this. In this culture, you want to keep your deceased family and friends happy. 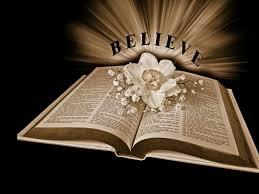 That way their spirit will stay and they will not leave. So if your great great grandmother is there, you go on behalf of the family so that she will be happy, know that she is loved and choose to stay in this world. I hope I have remembered and told the story as you told me Alex and Tim. 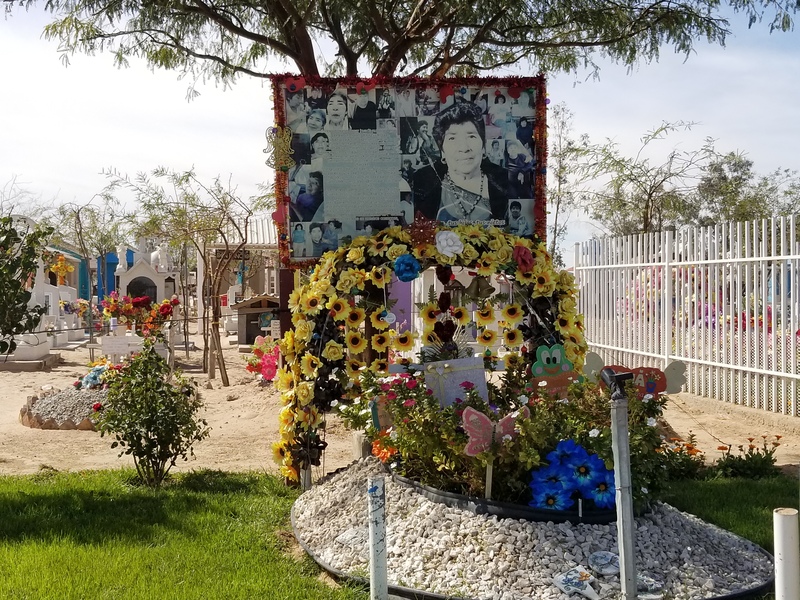 I have never heard of anything like this, and if I had not of seen these elaborate plots or spoke to people who were there visiting their loved ones, I would have never believed it. There was a family there building a larger than life Horse that actually rocked at the graveside of a wealthy man. It was so large that there were children riding on its neck as it bounced back and forth. Who knew? Alex made sure to tell me that this is not the beliefs of everyone. There is a growing movement of people letting go of this tradition, as more people learn about Jesus. Knowing that God has such a wonderful place for His children, why would anyone want to keep the spirits of their loved ones on earth. Interesting huh? 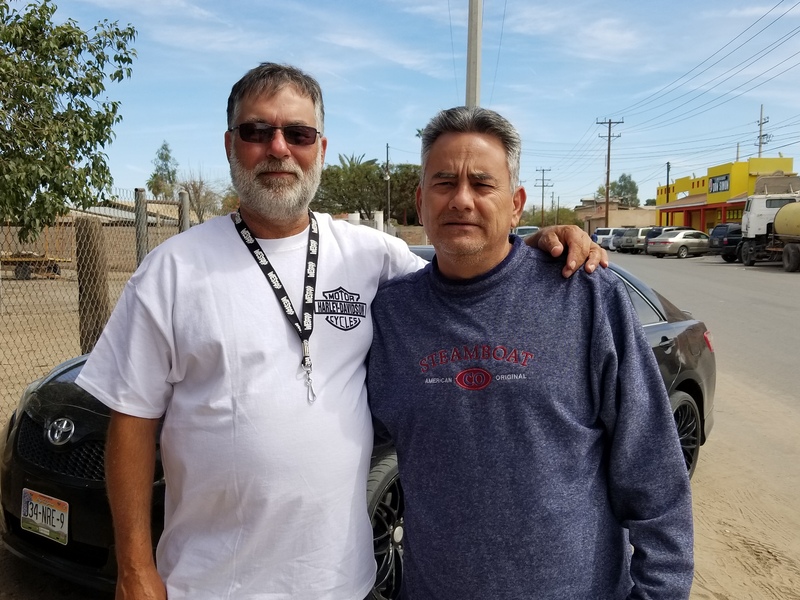 Well with the shock of what we had just seen burned into our memories, Tim and Alex drove us back to Los Algodones so we could pick up Journey and Chicago. It was a fantastic day! Oh how I hate to say goodbye and leave our friends behind! We keep in touch through Facebook and talk often on the phone. We will see them as we finish up our dental work in town, and when we are done here, we will have to look forward to another wonderful visit with them next year. See all of you soon. Take care, and may God bless you richly. We love you all.